We had a period in our religion when our scholars, or respected personalities of Islam used to travel far and wide for knowledge. They used to travel thousands of miles in extreme heat or cold, day and night and whilst living under tyranny or being persecuted for their beliefs. It was the thirst for knowledge that made these people leave their homes and families and travel the globe. It was also to verify the authenticity of what they wanted to learn before they educated their communities. The modern world is no different. Scholars travel to all corners of the world to seek knowledge from the most respected teachers and schools this religion has to offer. They sacrifice years away from home to better themselves and their people. On the other hand, you have people like me and you, the ‘average’ Muslim, living in the West or the East. We surf the web to get information regarding Islam, we debate on social media and spread what we have learned to others. There is no verification of the information or the source, we don’t even ask for guidance. Scholars used to travel for days just to acquire one hadith. They wanted to hear it with their own ears, so they could verify its legitimacy. At the rising of the sun, we are ordinary working class Muslims, by dusk, we have become experts in Islamic Jurisprudence. 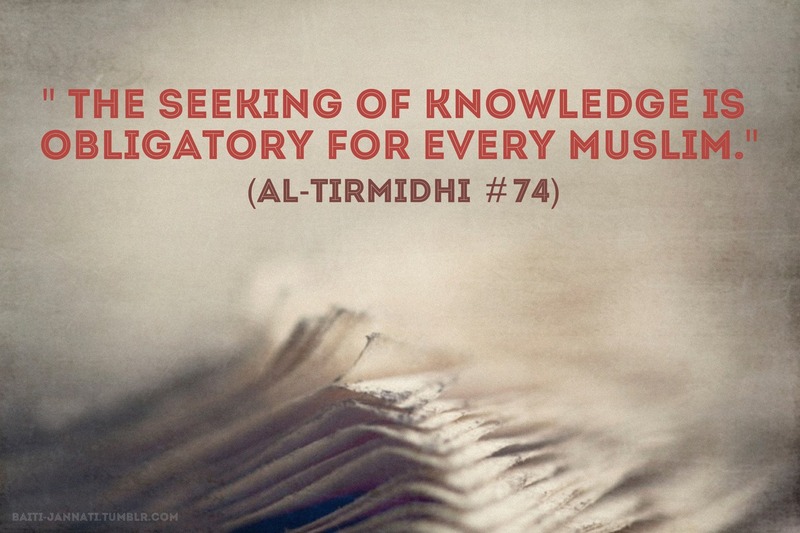 We think we can substitute minutes of acquiring knowledge, for years of sacrifice by our scholars. No doubt as time has evolved it has become easier to obtain what we need. However, sometimes it has become the most easiest and abused way for us. Mosques, libraries, institutes and ulema are at our disposal, use them wisely. We are not living in places like China, Gaza or Athens where Muslims are being persecuted for practising Islam. As Muslims living in developed countries, we have no excuses for being ignorant and uneducated. It’s becoming an increasing trend between some of us where we publicly criticise and refute others. The new fashionable way of doing it is on social media – keyboard warriors and YouTube heroes. We condemn a person or a scholar based on certain actions, or their interpretation of Islam, without even questioning why such a thing is being done or the reasons behind it. We will tear them apart without fearing Allah, and then if we find out we’re in the wrong, it becomes hard for us to apologies. The art of civil debating and meeting a person face to face to dialogue has been lost. Scholars are here to guide us, they are humans just like us, and mistakes are committed by everyone. It may not be their intention to preach falsely, they may be unaware of certain actions they commit, it’s our duty to rectify them within the parameters of Islamic law. Indeed some are amongst us to cause division, hatred and are adhering to outside agendas. We expose those that we shouldn’t, and hideaway those that need exposing. There will always be a difference of opinions when it comes to Islamic theology and Jurisprudence, for example; the schools of thought. As long as it’s minor, we shouldn’t allow it to cause tension amongst ourselves. The companions of the prophet differed in opinions, Umar ibn Al-Khattab (RA) and Abu Bakr Al-Siddiq (RA) differed on opinions, but it was for the love of the prophet Muhammad (PBUH) and for the sake of Allah. They didn’t detest each other and create sectarian hatred, they were still brothers in sisters in Islam. As an Ummah they were united, as an Ummah they protected the dignity of our sisters, they liberated lands that were under oppression, they fought against tyranny, they protected communities and they instilled a noble way of life. It’s disturbing to see how we have drifted away from everything that was handed to us, from that which the Ummah has shed blood, sweat and tears for. Today conferences and gatherings are held where Muslims refute and discriminate other Muslims. Without any reasoning we will criticise the shuyukh. We want to be the next Salahudeen or Khalid bin Waleed, yet we can’t speak out on things that matter to us. We admire the likes of Bilal (RA) but we look at colour, caste and nationality before we marry. We want to liberate Palestine and help the Syrians, yet we argue with our parents and break family relationships. Our sisters are being raped, our brothers imprisoned innocently, our children being made orphans, lands being stolen, and our leaders are selling their souls. While all this is happening we are busy arguing about where are hands should be in salat, if we should say ameen softly or quietly or whether it’s an innovation to say jummah mubarak. We will constantly discuss the same topics over and over again in the mosques and Islamic conferences. Surely all aspects of the religion should be attended to, but why the silence on issues that are challenging the Muslims today? Who are we scared of? Who are we trying to appease? There is nothing wrong with holding our roles in societies or status amongst people, but at what cost? At the cost of our brothers and sisters being killed and raped? At the cost of Al-Quds being taken over by Zionists on a daily basis? At the cost of injustice? We need to talk about the proper way of Jihad, we need to discuss the correct implementation of the Shari’ah, and we need to discuss the plight of Muslims worldwide. With the power we hold, we need to accept the responsibilities. The Ummah is asleep, we are breaking apart. The Muslims once contributed so much to the world, from advancements in technology and sciences to mathematics. Almost a third of the world at one time was part of the Islamic Empire, now we don’t even have a proper Islamic country. We have become lazy, ignorant and arrogant and relish in our past. We don’t act until it affects us personally, then we cry to the heavens for help. It hurts when people and nations label us as “terrorists” and “extremists”, but we have no problem in labelling are own with derogatory titles. The Ummah is bleeding and being raped from all angles, however it doesn’t seem to bother us. We are content with our materialistic life and ‘freedom’ that we have. It is time we realised what is going on around us and we need to make a stance. Without unity, very little can be achieved. The Prophet Muhammad (PBUH) on countless occasions made supplications for his Ummah, he shed tears for this Ummah. Where are our tears? Even whilst nearing his death, the prophet was attending to important matters. Things that we neglect and take for granted while we are living. He uttered words of advice and showed concerns for the Ummah. His final sermon was a speech for all mankind, past, present and future. People have come and gone, good or bad, they have left a legacy behind and made an impact on people. The question is, what will be our legacy, and what will be on our tongues in the final moments?